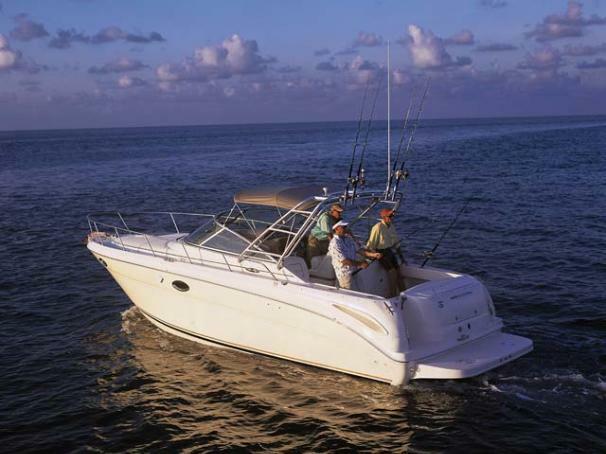 Boat Description Whether you`re planning a weekend of fishing, cruising, or a little of both the Sea Ray 290 Amberjack is suitably equipped. Shown here with the optional fishing package, this versatile cruiser features an aluminum arch with rocket launchers, four rod holders, a bait prep station with recirculating livewell, seawater washdown system, and much more. Air conditioning and heating also come standard, so no matter how you decide to spend your time on the water, you`ll always be comfortable. Engine Notes V-drive inboards and Volvo diesel stern drives also available.